Eeeek! Did I save the best to last? You bet your arse I did! 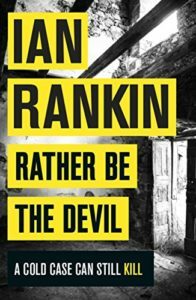 I am a HUGE fan of Ian Rankin and nearly fainted when Rather Be The Devil turned out to be one of my #BloodyScotlandReads – I love REBUS! So here is my final #minireview and I’m off to Bloody Scotland on Sept 8th – and maybe this year I will put my nerves aside and get a picture with Ian Rankin! Thanks to the wonderful Bob McDevitt and everyone involved in the McIlvanney Award for giving me this amazing opportunity for the second year running! John Rebus can’t close the door on the death of glamorous socialite Maria Turquand. Brutally murdered in her hotel room forty years ago, her killer has never been found. Meanwhile, Edinburgh’s dark heart is up for grabs. Young pretender Darryl Christie may have staked his claim on the city’s underworld – but has criminal mastermind and Rebus’ long-time adversary, Big Ger Cafferty, really settled down to a quiet retirement? Or is he hiding in the shadows until Edinburgh is once more ripe for the picking? Old Enemies. New Crimes. Rebus may be off the force, but he certainly isn’t off the case. OMFG! Have I mentioned I am a HUGE Rebus fan? I have to say though, I am a little behind in the series so was completely THRILLED to get my hands on a copy of Rather Be The Devil. We are, of course, back in Edinburgh – the seedy underbelly of crime and come face to face with the past & present; corruption; a cold case which niggles on Rebus’ mind; the old vs the new and shades of grey – nothing is ever black & white when it comes to Rebus! What I loved was the intricate and compelling plot of this story – it certainly kept me on my toes! It was a fast-paced read for me and I spent a few hours relishing the fine detective skills and intertwined narrative – seeing how much Rebus, as a character, has developed but still retaining the brash, bold and fantastic humour that I have always loved about him. Rebus is like an old friend, someone you can spend years away from, but when you come together – it is like you have never lost touch. Holy sh*t, though – retired, ill (COPD) and wondering what his future holds – I really saw a vulnerable side to Rebus that I quite enjoyed. This is what makes him relatable. Throw in Deborah (love interest), DI Siobhan Clarke, DI Malcolm Fox – I see a series here….and Cafferty, well that just made my day! I would suggest that readers get to know Rebus and the other characters before delving into this book as they may find themselves a little lost otherwise. So there you have it! Two seemingly unconnected cases pulled together in a tense, nail-biting read with one hell of a #Boom – I definitely recommend this book, this series, this author to anyone and everyone who loves a really gritty, dark and clever police procedural to sink their teeth into! Grab a copy of this book below! This entry was posted in Book Reviews, Mini Review and tagged #BloodyScotland, #Crime, #Crime #Twists #Murder, #CrimeFiction, #Murder, #OrionCrime, #Series, #Suspense, #TopRead2017 by crimebookjunkie. Bookmark the permalink.